When McVitie’s asked me to create a recipe using their new Digestives Nibbles I was really excited. I’ve been a fan of McVitie’s ever since I was a child, with penguins and clubs a regular feature in my lunch box for school, and I love their Jamaica Ginger Cake (ooh, I haven’t had any for ages, I really need to go and buy some 🙂 ). When they sent me the samples of their new nibbles to try I realised that for once I was ahead of the game. I’d actually already given them a try at a friend’s house a few weeks ago and really enjoyed them. They’re basically like tiny little chocolate digestives and they’re very moreish. Josh and I in particular couldn’t stop nibbling them. If you want to give them a try then head to the biscuit aisle of any major supermarket and if you’re a fan of biscuits (and super cute kittens) then take a quick look at their advert here. The nibbles come in four different varieties – milk chocolate, dark chocolate, double chocolate and caramel. I used the dark chocolate for this recipe, but any of them would work well (I particularly fancy substituting in the caramel instead of the dark chocolate sometime). 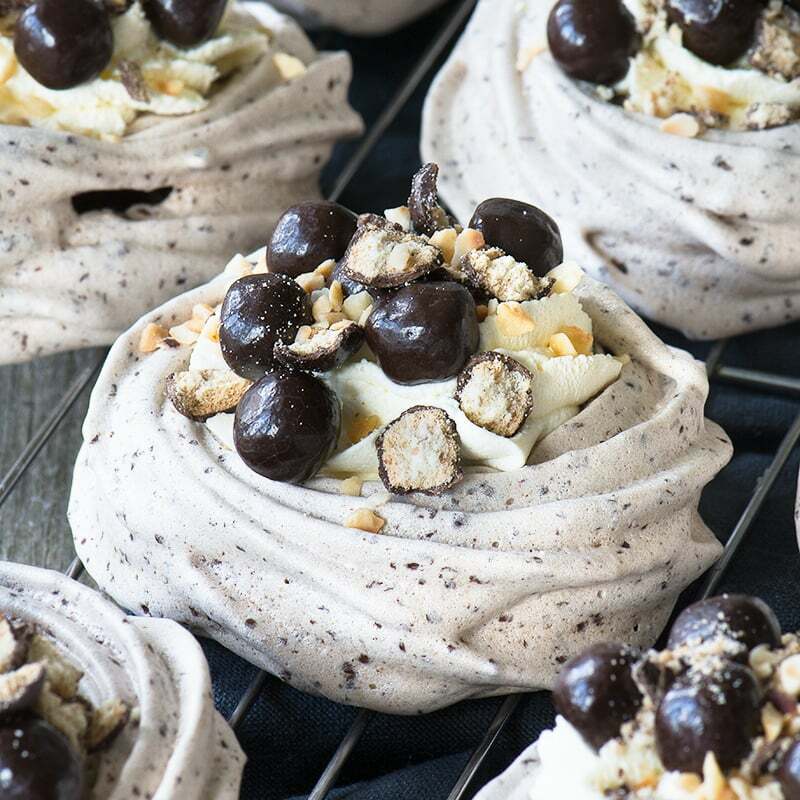 I think they look rather pretty too – definitely a bit of a showstopper dessert for guests and not actually all that difficult to make which is even better. Pre-heat the oven to 100ºC/80ºC fan. Finely grate the dark chocolate (50g). Put your 4 egg whites into a large bowl and whisk on a low speed until foamy. Once foamy, increase the speed to medium until the eggs whites form stiff peaks. Add the caster sugar (200g) a tablespoon at a time and whisk at a medium speed until combined. You’ll now have a lovely stiff glossy meringue. Sift the cocoa powder (1 tbsp), and then add the cocoa powder and grated chocolate to the meringue mixture. Fold in the cocoa and chocolate until everything is evenly distributed. Line a baking tray with greaseproof paper or a non-stick baking sheet. Put your meringue mixture into a large piping bag fitted with a star nozzle. 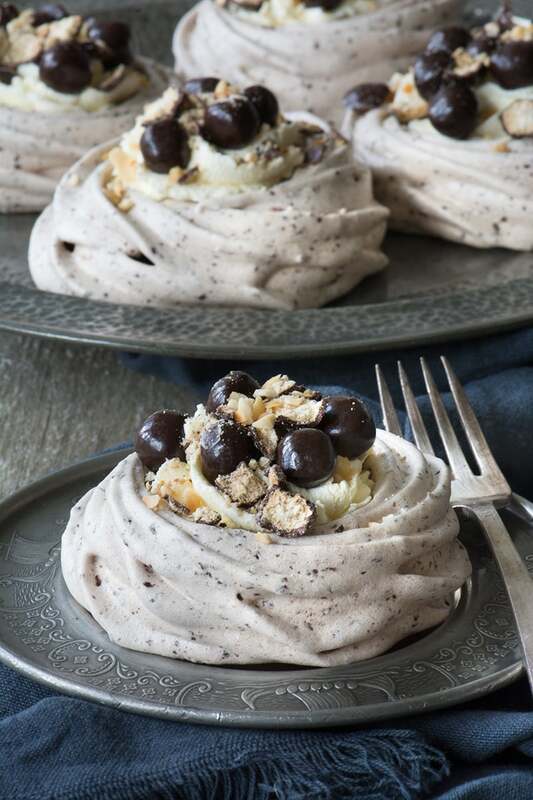 Start by piping a dot in the centre of your meringue nest, then in one continuous motion go around the dot twice to make a bigger circle and then go around the outside twice to build the sides. 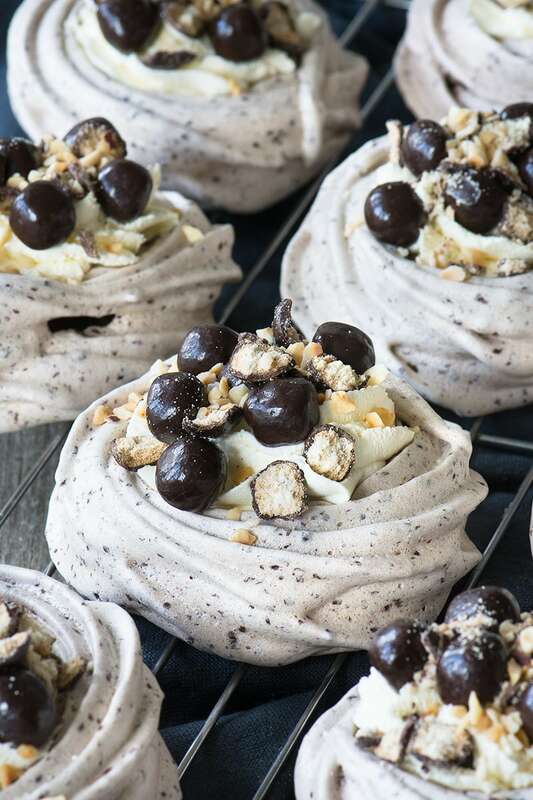 If you don’t really like piping then you can simply make 10 dollops of meringue on your baking sheet then use the back of a tablespoon to make a dent in the centre. There’s a little video here if you’d prefer to watch how it’s done. Bake the meringues for 1 hour 45 minutes. Once cooked turn off the oven and leave them to cool in the oven. It’s best to leave them to cool slowly in the oven but if you’re in a bit of a hurry then remove them from the oven and cool them on a rack (they’re slightly more likely to crack if cooled more quickly). Once your meringues have cooled, whip the cream (200ml) until it’s firm enough to hold its shape but still soft and smooth. Spoon or pipe cream into the centre of each meringue. Take a third of the McVitie’s Digestives Nibbles (30g), put them into a small plastic bag and bash them with a rolling pin a few times to break them up a bit. 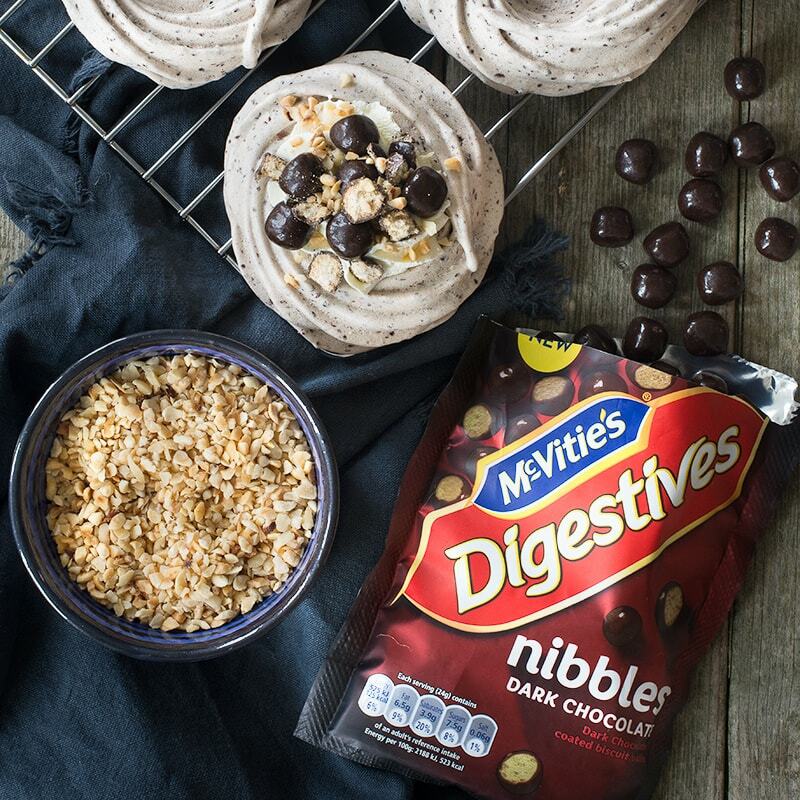 Divide the remaining McVitie’s Digestives Nibbles (60g) onto each of the meringues and then sprinkle over the crushed biscuits and chopped hazelnuts (1 tbsp). I’m sharing this recipe with the following blog challenges… CookBlogShare with Hijacked by Twins, Treat Petite with The Baking Explorer and Cakeyboi, We Should Cocoa with Tin & Thyme and my own #TheFoodCalendar challenge for Chocolate Week which will be celebrated next month. Thanks Kate. I think it would be difficult to take a bad picture of these as they’re pretty little things. I originally made them with just whole nibbles and nuts sprinkled on top and they looked a bit odd, it’s amazing the different smashing a few of the nibbles made. 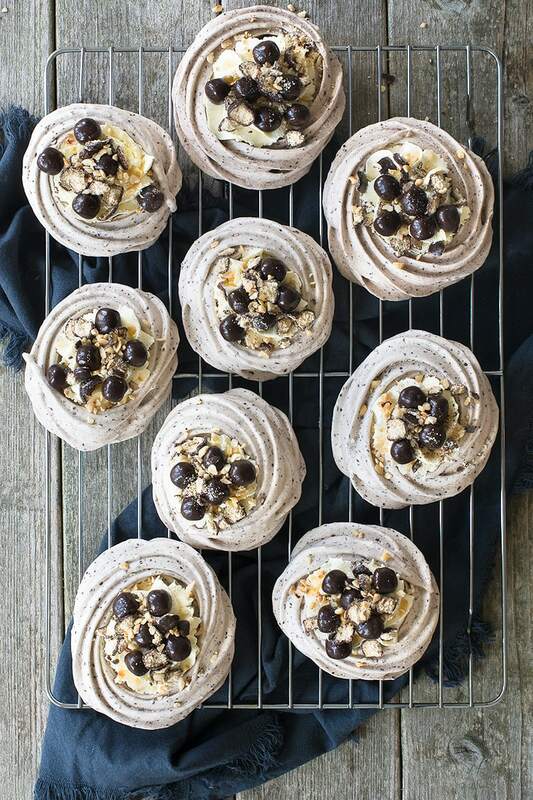 Oh these meringues look scrummy, and so moreish! I spotted the little McVities bites today at the station. Definitely something I’ll try soon!